Lark Writes...on books and life: Peaches, apples, and pears....oh, my! "Oh those weeks of harvesting and peeling and preparing apples, peaches, tomatoes, cucumbers, plums and beans. All day the kitchen smelled like heaven and was filled with steam. The stove was covered with kettles and vats, and upside down on the windowsill stood processions of mason jars full of bright color..."
It's that time of year again. time to turn Gala apples into sweet applesauce; time to bottle peaches and pears; make fresh pear cake, peach jam, and yummy fruit cobbler; and time to bottle pickles, relish, and homemade spaghetti sauce. It's a lot of work (and a lot of clean up when you're done! 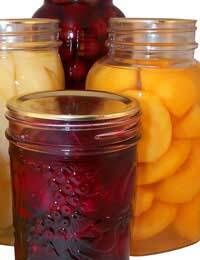 ), but this annual ritual of bottling fruit is like bottling a little piece of summer to enjoy all winter long. My grandma started us off, too. I love that you found a quote for canning season! It is a lot of work, but there is something satisfying about seeing all of those beautiful jars full of ripe fruit lining the shelves in anticipation of winter. Thimble Summer is a fun middle-grade fiction novel that epitomizes summer; you should totally read it. I'm completely impressed (says the woman who's bottled nothing, ever).